We haven’t shared a Project Restyle in quite some time. The basic idea is you take something (furniture, clothing, etc.) and refresh it into something you love even more. This could mean repairing a broken or neglected item, or it might just mean changing something up because you want to. I’d say this project falls into that second idea. Lately I’ve been a little obsessed with making small updates to our home. I’ve just been in the mood to change things up a bit, and I’ve mainly been focused on our bedroom this month. Here you can see a before and after of our bedroom drawers. The “before” photo you see is actually from our book Happy Handmade Home. And I haven’t changed up our bedroom too much since around the time we were writing that book. I decided I wanted to cover the front of the drawers with a giant (blue print) photo. This is a similar project to one you can find in our first book, A Beautiful Mess Photo Idea Book. In case you’re thinking of doing a similar project anytime soon, here’s how I did mine. *Note on what photos work well: If you are covering a piece of furniture that has drawer handles or pulls, you’ll want to be mindful of their placement on your photo. If I had used a photo that had people as the subject, the drawers may have hit right in the subjects’ head or body in a way that ended up looking kind of weird. In my opinion, the best photos to use for this type of project are either something more abstract (like a grouping of succulents or flowers) or a landscape photo. First, create a pattern for your furniture piece onto scrap paper. Use this pattern to cut your blue print photo. Remove any hardware from the drawers beforehand. Next, lay your photo onto the surface of the drawer and use a few pieces of painter’s tape to secure the photo in place. Use a foam board or cardboard to divide the paper in the center and fold half of your photo onto the board. Paint a thin layer of the decoupage finish onto the back side of the photo. Starting from the center, gently lay the photo into place, smoothing as you go. Try to avoid getting air bubbles or wrinkles in the paper as you work and smooth either out towards the side or towards the top or bottom as needed. Repeat on the other side and continue the process on all the drawers. If you find that your pattern wasn’t perfect, use an X-Acto knife to trim the edges once the finish has completely dried. Add a coat or two of the decoupage finish to the outside of the photos and allow to fully dry before putting the hardware back on. I noticed that while adding the outside coat of finish, the photo looked bubbled (when wet) but this will go away as it dries, so don’t freak out (I almost did!). Credits // Author and Photography: Emma Chapman, Project Assistant: Laura Gummerman. Photos edited with A Beautiful Mess actions. 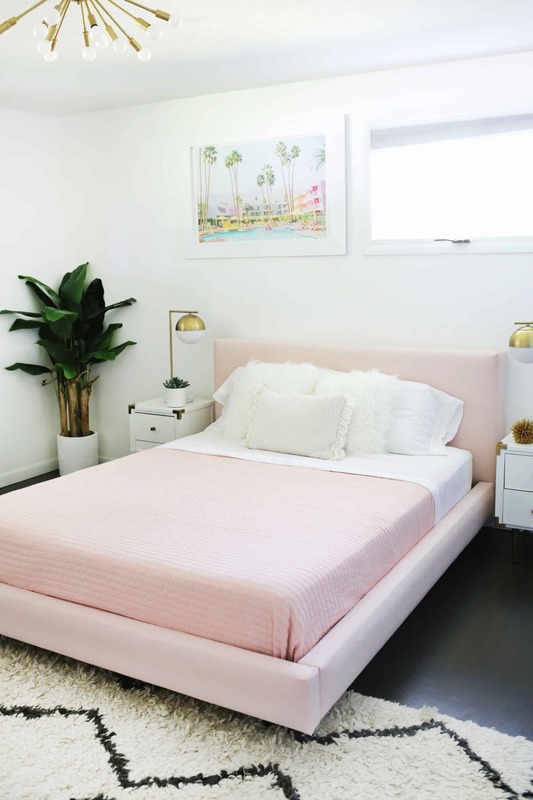 Reupholster Your Bed Frame in One Afternoon (with a no-sew option too)! Seems so easy but I did decoupaged furniture onces (drawers too) and promissed myself “never ever again”. What a great project, Emma! And the picture that you picked is just perfect. Were you able to print that size at home or did you have to send it to some sort of copy and print centre? This is lovely. I really love the photo! This looks great! I absolutely adore decoupage! During mine and my husband’s engagement, I created a change jar (for a little extra wedding cash) out of what had been a huge plastic container filled with pretzels, a bunch a pictures of flowers and feathers that I tore out of a wedding magazine, and modge-podge. It turned out great and I still use it for decor because it goes with everything! I LOVE how this turned out! I would love to do something like this with my daughters old dresser! What a simple and lovely transformation! What a simple, fun and affordable dresser transformation. I will be looking for a nice night stand to transform like this. You ladies sure do think of the best restyle projects. Thanks for sharing! This is a really creative cost effective idea! The photo you used looks really great – the drawers look very chic and stylish. Ooh that’s lovely. I have a chest of drawers I just hate, should definitely do this with them. Oh my, this is really a great idea!! I love it! No I had to get it printed at a copy and print centre. This type of print is often called a blue print copy, it’s used by building developers for large scale planning. The quality is not at all as good as my Canon printer. But it was the size that I was going for, and the sort of grainy quality gives it an artistic look. You ladies never cease to amaze me. This dresser is beautiful and I love the idea of using your own photos. Awesome! I love it, it looks so different! This looks great! What are your thoughts on this decoupage product versus modpodge versus something more heavy duty like polyurethane. I guess the polyurethane would yellow and maybe cause color to run? I thought modpodge would not wear well for furniture (it is not waterproof, for example) and did not adhere well to a smooth plastic surface without any prep. Did you sand the surface at all first? What a beautiful project! I am blown away by how nice this looks! This actually seems way easier than I thought! I love how you went with a black and white design – simple, yet effective! Love this! The possibilities are endless. I would love to see what a black and white photo would look like! That looks so neat! What a great idea. Very stylish! Just curious, why did you use a different decoupage medium for this project, rather than Modpodge? Wow excellent piece of work!This just amazing idea to do in simple way.. Thanks! So pretty! I adore this hack! I cant believe how lovely this is! I am a huge lover of redesigning and revamping furniture! What a great job! If this isn’t creative than I don’t know what is x.
That’s a great idea! Maybe I’ll try it sometime, perhaps with a photo of a palm tree. Instant vacation mood! oohh, gosh… it looks just perfect!! so unique and extraordinary! as far as you are a blogger and you often deal with photos, perhaps, you will find my photo app really useful and interesting. warmly welcome to try it here: carde-app.com. thanks a lot, Elsie and Emma!! This was such a beautiful mid-century dresser and I cannot believe you would decoupage anything on to it 🙁 So sad. Pretty, reminds me of spring. Such a great idea! It’d be interesting, but maybe a bit tedious, to try this with Instagram print outs. Looks great! I’d love a post on tips on how to style the top of a chest of drawers / bureau like that. I live in a studio apartment and I have quite a tall chest of drawers and I’m never sure how to deal with the space on top (but it’s so out in the open of my apartment! )….always end up having too much resting atop there. So I’m interested in what kind of print would not run if wet glue was applied. Was it ink jet? Laser? What kind? How much did the print cost at the local print shop? This would look perfect in a girls bedroom who’s not very girly because of the black and white colors. It’s so pretty and sophisticated. I love this idea!! I’m in the midst of a huge overhaul of our house, including painting kitchen cabinets, installing new hardware, painting old furniture, etc. I’m doing image transfer onto a couple of pieces, but I have a chest where THIS project would be absolutely perfect. Can’t wait to try! This is so artistic I really love it ! 🙂 A great way to redo your place. Amazing! This is beautiful… I’ve never done anything like this before! Maybe one day I will try! It looks amazzzingggggg! So delicious! Need to try this recipe. Do you know if you can get this sort of print done in color or just black and white, not blue? I would love to do this with some purple orchid pictures I took at the MoBot orchid show but the blue wouldn’t match my bedroom decor. Looks awesome! How do you think this would work with dresser drawers that have carved-in pulls, not detachable hardware? My inclination would be to paste a whole sheet on, then cut out the hand pulls afterwards. I would love to try it! Was the print on actual blue print paper? Regular Paper or some sort of photo paper? This is brilliant use for a favourite photo. How do you stop the edges from curling up or getting tatty?